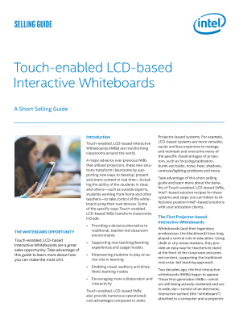 Explore this selling guide and learn more about how touch-enabled, LCD-based Interactive Whiteboards (IWBs) are transforming classrooms through a standardized platform that helps address scalability, flexibility, and concerns over cost and remote management. Accept secure card payment anytime, anywhere—Payleven connects a card reader with an app to an Intel®-based mobile device for simple, quick service. This mobile retail technology delivers a flexible and secure solution so customers can find what they want, when they want. Intel and JDA combine sensor technology and analytics for inventory insights that deliver a profitable experience. See how Hitachi, Intel, and SAP are helping retailers build a comprehensive solution to store, manage, and analyze big data. Intel helps enhance the retail experience with technology for inventory accuracy and tools that empower employees.